If you wear a dress and have an animal sidekick, you're a princess. (SPOILERS) Disney’s 56th animated feature (I suppose they can legitimately exclude Song of the South – which the Mouse House would rather forget about completely – on the grounds it’s a live action/animation hybrid) feels like one of their most rigidly formulaic yet, despite its distinctive setting and ethnicity. It probably says a lot about me that I tend to rate this kind of fare for its wacky animal sidekick as opposed to the studiously familiar hero’s journey of Moana’s title character. You can even see the John Lasseter-Pixar influence in the fricking cute kids burbling through the opening scenes, before Moana (Auli’I Cravalho) arrives at teenagehood and heirdom to becoming the tribal chief on the Polynesian island of Motunui. And you can tick off the boxes of your Disney female protagonist required to prove herself (over-protective father opposing her desire to get out there and explore the world, meeting an unsympathetic male in whom she instils emotional growth). There’s also a slightly cloying aspect to the Disneyfied cultural sensitivity here, trying so desperately hard not to offend and be inclusive that one can only be amused at the massive gaffe that occurred in marketing (a Maui skin suit costume withdrawn from sale; that’ll teach animators to come up with concepts lacking sufficient merchandising possibilities. If only there were lots of cars on Motunui. Cars with big expressive eyes). I’ll be honest and admit that Ron Clements and John Musker fare isn’t among my Disney favourites, although I love that they brought in Gerald Scarfe for Hercules and will readily attest that The Princess and the Frog (sadly the last traditionally animated feature from the studio, at least to date) is much underrated. They’re co-credited here with Don Hall and Chris Williams (Big Hero 6, another serviceable but unremarkable feature), although the writing side has three additional names for the story and Jared Bush given the screenplay credit (his Zootropolis/Zootopia is far superior). There’s a resultant feeling of a movie honed into a shape that divests it of true personality, in favour of polished, anaemic likeability. There’s nothing to dislike about Moana, but there’s nothing particularly to get excited about either. Even the songs, from Lin-Manuel Miranda, are mostly politely insipid, aside from the very funny Dwayne Johnson-sung You’re Welcome. 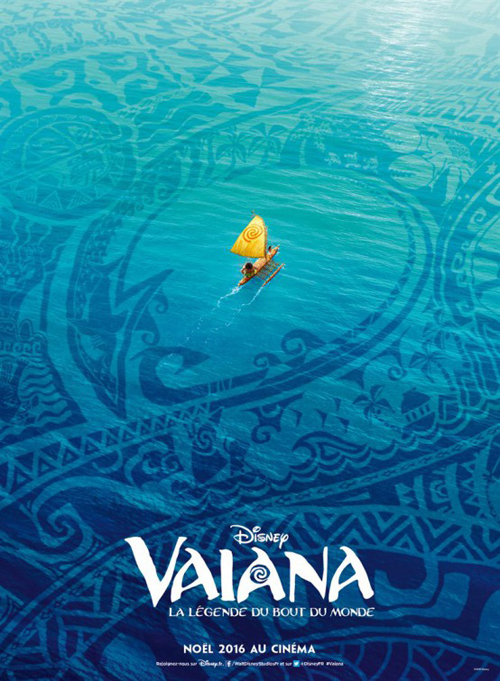 Johnson’s effective as the brash, egotistical, self-centred demigod Maui, disappearing into the role rather than making you aware of the voice artist (rarely a good idea, unless it’s Eddie Murphy) whom Moana must persuade to help return stone the Heart of the Ocean to the island goddess Te Fiti (which Maui stole). However, the real prize goes to Alan Tudyk as permanently startled rooster Heihei. His reaction upon finding himself out at open sea is hilarious, even more so his continual inability to stay on the canoe. Heihei certainly eclipses Jermaine Clement’s giant coconut crab Tamatoa, which is a surprise, as an animated movie is usually at least about 50% better with Clement on board (he absolutely makes the Rio movies). Clement has the occasional good line (“I ate my grandma. And it took a week, because she was absolutely humungous”) but one gets the sense he hasn’t been give the rope to improvise as much as he normally would (and they probably should have let him write his own song). After a while, I began to find the strokes of the relationship between Moana and Maui a little on the tiresome side, particularly since they pull out the “anti-hero goes off and returns at the last-minute card” (Han Solo). But the reveal that lava demon Te Kã (bearing a resemblance to William Hurt at the climax of Altered States) is really Te Fiti without her heart makes for a thematically appealing twist ending, justified in its emotional effusiveness. The animation is expectedly proficient, but much-of-a-muchness in terms of design; why the ocean is personified as a water tentacle out of The Abyss, I wasn’t quite sure. Other than Te Kã, it was only Maui’s animated tattoos that really grabbed my attention. I’m clearly in the minority, but I found Moana a little too rigidly formulaic to have the impact of other recent Disney princess fare (Tangled, Frozen, The Princess and the Frog).